Bed bugs love to hide in the tiny crevices of bed frames, in the seams of mattresses and cushions, and at the corner of carpets. For example, bed bug powders are good for treating areas around bed frames where bed bugs are frequently found. Natural sprays can be used on mattresses, box springs, and soft furnishings to exterminate bugs fast. You can also freeze-treat bedding and bed linen by putting them in the freezer for a few days. In this article, you will learn about the best bed bug treatments you can use at home yourself. You will also find out how to prevent infestations of bed bugs and how to spot signs that you need to start eradicating them quickly. Bed bugs can quickly become a major problem in the home. Bed bugs are small crawling creatures that generally come out at night time. They are about the size of an apple seed and live in groups. Dr. DerSarkissian says that places around the home where bed bugs like to lurk are in mattresses, the nooks and crannies of bed frames, box springs, behind headboards, and the corners of carpets. If treatment isn’t done promptly to kill the bed bugs at the first sign of them inhabiting, they can move to other rooms in the home. The first step in treating bed bug infestations is knowing how and where to look for signs of bed bugs in the home. In the joints of bed frames, furniture, and drawers. In the seams of soft furnishings including mattresses, cushions, and pillows. Behind loose wallpaper and picture frames. To find the bed bugs you may need to use a flashlight and you should check in any crevice that is large enough to put a credit card in. Here are the best ways to get rid of bed bugs by yourself. The first step is to physically remove all bed bugs from your rooms using a vacuum cleaner. This will kill off a large number of bed bugs that are crawling around your mattresses or bed frames. A brush attachment on the end of the vacuum cleaner nozzle can help to loosen any bed bug eggs. Another way to get rid of bed bugs from clothes, bedding, and small pillows and cushions is to freeze them. Bed bugs and their eggs die off in freezing temperatures and this is a great way to treat fabrics without chemicals. According to the Texas A&M University, you should bag and place fabric items in a chest freezer for up to 10 hours. The freezer should be at least 0°F (-17°C) to ensure that all the bed bugs and their offspring are killed. Hot steam is also lethal to bed bugs and is an environmentally-friendly way to eradicate these biting pests. Steam cleaners can direct hot jets of steam into bed furniture cracks and crevices and also effectively treat infested mattresses and spring boxes. The University of Minnesota recommends steam treatment for getting rid of bed bugs yourself. Steam is a great way to easily penetrate fabrics like drapes, carpets, upholstery, and cushions. For the steam to be effective in exterminating bugs and other insect pests, the treated surface should be between 160°F and 180°F (70°C-80°C). To quickly eradicate bed bugs with steam, you should make sure and have the appropriate kind of steam cleaner. The best kinds of bed bug steam treatments have a steam volume control and a large water tank (like this one). Smaller steamers (like this one) may not have enough power to get the steam up to the correct temperature. They also require frequent filling if you are treating a large bug-infested area. Once the bedding and clothes have been washed, you can make sure and kill off all remaining bed bugs by putting them in a dryer on a hot setting for 30 minutes. Another way you can use heat to treat small groups of bed bugs that are in crevices is by using a hot hair dryer. Turn the hair dryer to its hottest setting and direct the hot air into cracks where you know bed bugs are hiding. The next step in eradicating bed bugs from your bedroom is to encase all bedding like mattresses, pillows, and spring boxes. You can buy special encasements for bed bug control that don’t allow the annoying critters to come out at night and bite you. According to the National Pesticide Information Center, encasements should be kept on for at least a year to ensure that all bed bugs die naturally. You can also place special traps under bed legs (such as this one) to prevent bed bugs crawling up. Although it’s important to physically remove bed bugs and exterminate them with heat or cold treatments, those methods aren’t enough to completely get rid of bed bugs for good. Let’s look at some of the best natural insecticides and pesticides you can make at home for bed bug control. Diatomaceous earth (DE) is a non-toxic way to treat large areas of a bed bug infestation. DE destroys bed bugs naturally by destroying their exoskeletons and causing them to dehydrate. By sprinkling the bed bug powder in areas where bed bugs are living, you will eventually get rid of the bugs completely as they die off and no longer produce eggs. To treat areas where bed bugs are living, you should dust diatomaceous earth around all joints on the bed frame, corners of carpets, and behind baseboards. Reapply the DE powder every 3 days and continue until there are no signs of bed bugs. When using DE to treat bed bugs, you should use the type classed as food grade (here is one example). This is safe to use around the home and won’t be harmful to pets if they come into contact with it. You can use tea tree oil as a natural insecticide spray to help in your battle against bed bugs. Tea tree oil contains compounds that are lethal to insects and also help to disinfect germs. A homemade tea tree oil spray for bedbugs can also be used to spray into furniture crevices, cracks, and other hard to reach places. To make a DIY bed bug spray with tea tree oil, you just need some water, tea tree oil, and a small spray bottle. Put 20-30 drops tea tree oil in a small spray bottle and fill with water. Shake well and spray liberally into all areas where you suspect bed bugs are lurking. Treat the areas until there are no more signs of bed bug activity. If you have bed bug bites, then you can dab on a tiny amount of tea tree oil to the red itchy bumps as a spot treatment. This will help to reduce inflammation and itching and prevent any skin infection making the bites worse. Many essential oils have bug-killing properties and you can use them to treat surface, fabrics, and crevices that have signs of bed bugs. One of the great advantages of using essential oils as a weapon against bed bugs is that they help to treat odors that bed bug infestations cause. To make your own home remedy for bed bugs, you can use a combination of essential oils in a spray bottle. Fill a small spray bottle with water and add 10 drops of cedar oil, 10 drops of cinnamon oil, and 10 drops of peppermint oil. Spray 2 times a day around areas where you’ve noticed bed bugs being active. Repeat the treatment daily until there is no longer any evidence of bed bugs. Preventing bed bugs becoming a problem in your home is much easier than treating a large infestation. Vacuum regularly in your home and keep your home as clutter-free as possible. Regularly check your bed for signs of bed bugs and take immediate action if you see blood spots, shed skins, or eggs. Encase mattresses and box springs. Inspect hotel rooms you will be staying for signs of bed bug activity (just remember that bed bugs aren’t a sign of dirtiness). After arriving home from vacation, unpack clothes directly into the washing machine and use the hot washing and drying cycle to kill any hitchhiking bed bugs. Vacuum luggage when you arrive home from vacation. Thoroughly check the joints and screw holes in second-hand furniture for bed bug signs. EPA. Introduction to bed bugs. UMM. Bed bug control in residences. EPA. How to find bed bugs. Clin Microbiol Rev. 2012 Jan; 25(1): 164–192. NPIC. Bed bug control methods. Vet Parasitol. 2012 Mar 23;184(2-4):271-8. EPA. 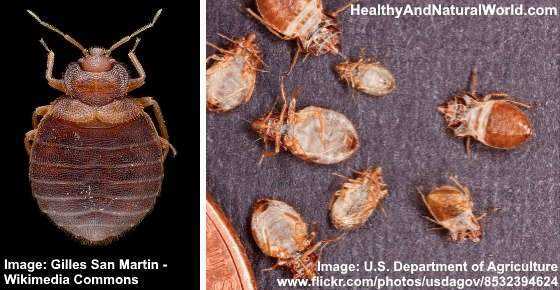 Protecting your home from bed bugs.